It received €8 million from the German federal ministry for economic affairs and energy to will cover construction of the test bench, and a further €3.4 million from ministry of education and research and the state of Bremen to cover construction of the hall. Bremen's authorities also granted €253,000 for ‘method development work’. It will start work on the new bench at the end of 2019 and the site in Bremerhaven, north Germany, is expected to enter operation in 2021. A large test bed will be used for full-scale blade testing, while smaller benches will be used for segment and component tests, Fraunhofer IWES said. "It’s not just about testing longer blades. We also want to test more intelligently and expand our position as a leading institute for rotor blade tests," said Steffen Czichon, head of Fraunhofer’s rotor blades department. Fraunhofer IWES' existing two halls at Bremerhaven are capable of testing blades of up to 90 metres. The 115-metre long blades capable of being tested at the new site would be longer than those currently planned for the largest offshore wind turbines. GE’s 12MW Haliade-X turbine will utilise 107-metre blades and Siemens Gamesa’s forthcoming SG 10.0-193 model will feature 94-metre blades. Meanwhile, MHI Vestas’ V164-10.0MW turbine uses 80-metre blades. "Large independent test facilities are a major enabler for our upcoming developments of large offshore turbines. 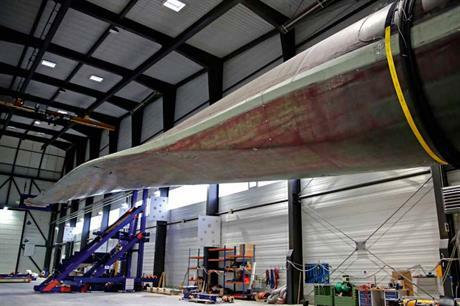 New concepts such as component and segment testing of blades are extremely interesting for us," said senior project manager at MHI Vestas, Flemming Kløcker Grove. A previous study had investigated the viability of small-scale test procedures, Fraunhofer IWES stated, while a second phase will employ these processes at a larger scale.